The Center for Civic Innovation is proud to announce the 2019 class of Civic Innovation Fellows. The Civic Innovation Fellowship is a leadership and business development program for social entrepreneurs in Atlanta. 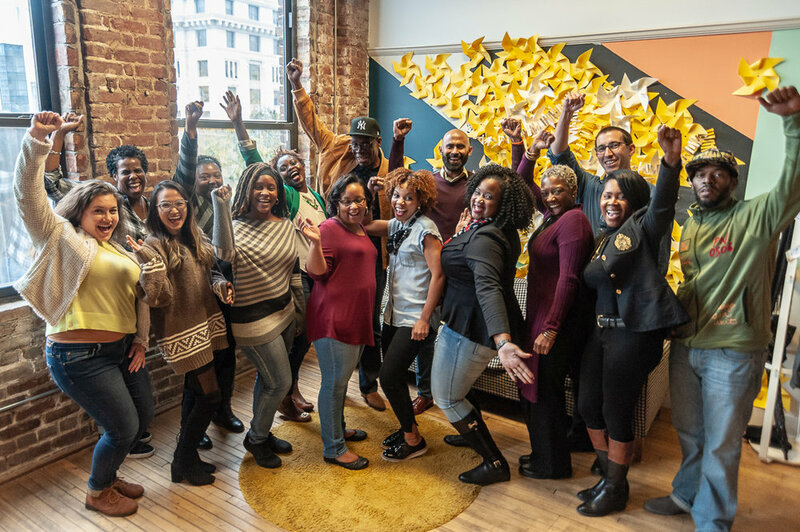 This fellowship brings together a cohort of individuals with innovative, outcome-driven ideas to tackle social challenges in Atlanta and provides them with business development workshops, free workspace, mentorship, advising, and leadership development training. In 2016, the Center for Civic Innovation launched a partnership with Food Well Alliance to support entrepreneurial efforts that advance the strength of our local food system. Through this partnership, the Center reserves a select number of seats in the Fellowship for leaders that are focused specifically on local food. "Atlanta is rapidly changing. Leaders across our region are quickly responding to the rising gaps in food and nutritional access by developing innovative solutions that serve the communities most in need,” said Kim Karris, the Executive Director of the Food Well Alliance. “By partnering with Center for Civic Innovation through our Food Innovation Fellowship, Food Well Alliance is able to invest in the entrepreneurial capacity of these local food leaders. As an Alliance, we believe that community-driven solutions to local food challenges in our city are needed now more than ever." Now, CCI is also proud to announce the five Food Innovation Fellows that will be joining 11 other peers as part of the 2019 class of Civic Innovation Fellows. Akissi Stokes | WUNDERgrubs: Aims to address issues of food insecurity, land degradation, and water scarcity, as well as to counter factors that limit access to low-tech and low-capital investment farming options by manufacturing edible insect products that offer a healthy, affordable, and sustainable food option. Michelle Namer | The Law Farm: Works directly with local farms and production enterprises to strengthen their legal footing in day-to-day dealings and ongoing goals. The Law Farm is dedicated to creating a community resource which ensures relevancy, comprehensiveness, and effectiveness in providing a range of legal assistance to local food system enterprises. Trinita Ervin | Ladybug for Girls Foundation, Inc.: Our solution is to institute a multi-level obesity prevention approach by shifting our programming away from solely serving schools to broadening our scope to include local communities using social and environmental contextual factors. We plan to achieve this through the development of a train the trainer model which will allow us to increase participation in high-risk populations and to connect girls to local health-related community resources. Elijah Lee | Chef Zu: Promotes access and knowledge to non-meat protein alternatives. Our project proposes to offer pop-up style markets selling pre-packaged Nuts, Seed & Grains, as plant-based meat alternatives which are local to Atlanta. Ivory Flemister | From Farm to Fork on Four: Wants to create a working urban garden that serves the community by teaching how to grow their own food, providing fresh vegetables from the garden, having a community table for social gatherings, providing a meditation and sensory garden.